Elena Blake is a tiny person that “runs big”. The 5’4” petite Quality Assurance Researcher for NAPA Balkamp uses her Ram 3500 diesel pickup that she purchased to tow her horses as her daily driver. “I have a three-horse steel trailer and most of the time I don’t even feel the trailer and horses behind me because of the power and smoothness of my truck,” said Blake who hails from New Ross, Indiana. “More than my comfort, I am an animal lover and I care about how my horses feel and I know they have a comfortable ride in the Ram,” she said, adding that she has hauled up to 22 large roundells of hay bales behind her truck, as well. Blake’s Ram is going strong with 331,000 miles on the odometer, but the new 2019 models have caught her eye. “I love trucks and don’t even know if I could drive a car anymore,” she added. 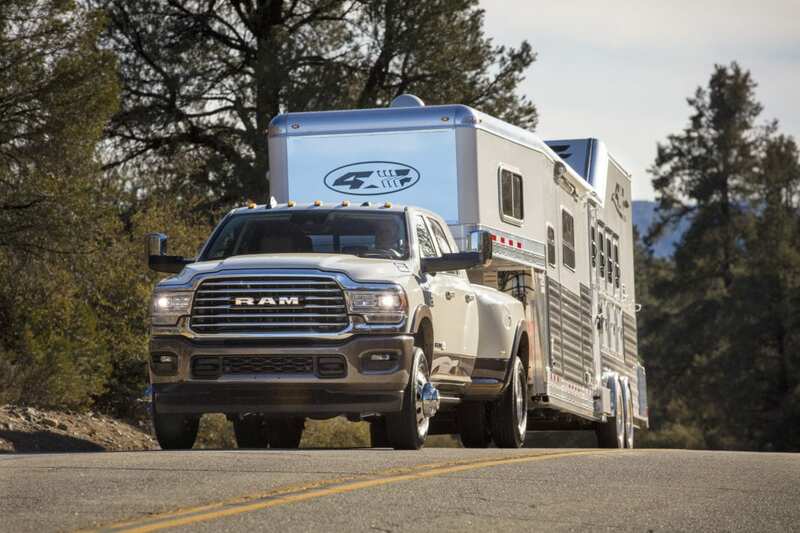 Ram has followed its successful release of an updated, award-winning full-size 1500 pickup last year with all-new 2019 Heavy Duty 2500/3500 models. The updated trucks have been engineered to work and play aggressively and are laden with technology, connectivity and luxury. Plus, they have been designed to set benchmarks in ride and handling, materials and innovations. There are 35 all-new and 21 class-exclusive features, with more than 100 safety and security features, including class-exclusive active safety systems such as Adaptive Cruise Control, Forward Collision Warning, Automatic Emergency Braking (AEB) and AEB with trailer brakes. Superior hauling and towing capability are the basic essentials in this segment of the market and the new model shines with auto leveling rear air suspension for ease of loading cargo, trailer hook up and leveling when towing; Surround View Camera w/Reverse Guidance for productively and safely working in tight spaces; a Cargo Bay Camera to monitor load or aid in aligning 5th wheel/gooseneck trailer hookups; a Cargo Bay 115V/400W power outlet and LED Lighting; and added Backup Sensors covering the added width of dual rear wheels. Of note, the Side Mirror Mounted Auxiliary LED Reverse Lamps light the side of the truck to the rear when backing up at night and the mirrors can be swung out to shine the light away from the truck, making good illumination for working at night, as well. The truck’s exterior has been updated with bold interlocking design elements, a new and lighter aluminum hood, all-new wheels and bumpers plus six different grille treatments for the six distinct price classes (there are five trims for the 3500). Three new headlight designs include advanced LED with Adaptive Front-lighting System (AFS) and the available RamBox Cargo Management System with a 115-volt outlet that projects up to 400-watts of power. The interior is punctuated by new, authentic premium materials, colors and textures, including hand-wrapped leather instrument panels. A reimagined center console has 12 different storage configurations and a wider docking area for tablets and smartphones. Also on board are optional dedicated/assignable switches, a wireless charging dock and up to five USB ports, including type C ports. Up to three 115-volt 400-watt plugs are available in the cabin, depending on the trim. Stowage that will accommodate a 15-inch laptop is located beneath the three-position sliding cupholder tray that slides under the armrest. Four audio systems are available including the powerful 750-watt, 17-speaker Harman Kardon sound system. 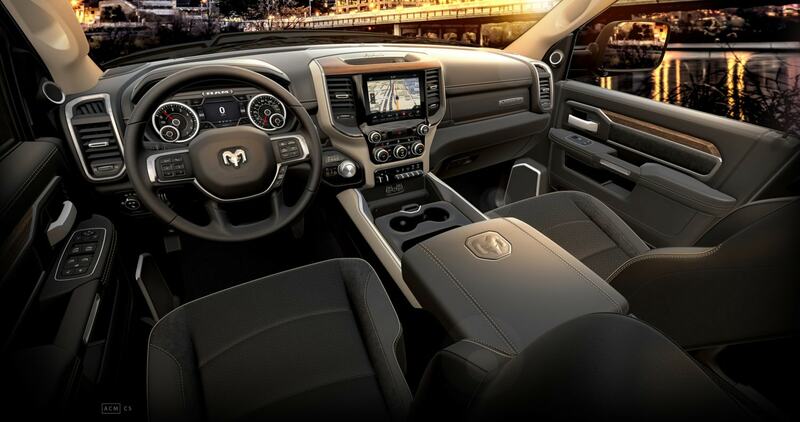 Ram says that an active noise cancellation system with anti-vibration devices and acoustic glass make it the quietest Heavy-Duty cabin ever. The engine lineup is led by an available new Cummins 6.7-liter high output turbo diesel delivers 1,000 lb.-ft. of torque @ 1,800 rpm that is mated to an updated electronically-controlled six-speed automatic transmission; a smaller diesel produces 370 horsepower @ 2,800 rpm and 850 lb.-ft. of torque. Standard is a 6.4-liter HEMI gasoline V8 that gets 410 hp. and 429 lb.-ft. of torque, with cylinder deactivation, that is mated to an eight-speed automatic. An all-new frame design is comprised of high-strength steel with wide front rails to allow outboard positioning of front springs for improved ride quality. Tuned for each model’s load and task requirements, there are Frequency Response Damping (FRD) shocks, with progressive springs and re-engineered bushings. I drove a number of Heavy-Duty models but concentrated my driving in the Ram 3500 Limited Mega Cab 4 x 4, with dual rear wheels, motoring on highways outside of the Las Vegas environs and towing loads in a nearby mining area with steep grades. In addition to the quiet cabin, smooth ride, powerful acceleration, firm braking and convenience of controls, I made note of the eight-way power-adjustable heated/ventilated premium leather front bucket seating, plus rear heated seats; heated steering wheel, full color driver customizable information display and split/screen info display, plus the adjustable pedals that allowed me to have the perfect ergonomics as another tiny driver in a big truck! The new 2019 Ram Heavy Duty starts at $33,395, in six trims, while a top-of-the-line 3500 that comes in five trims, starts at $65,700. TURNING CIRCLE (curb-to-curb) 15.6 ft.
CURB WEIGHT 6,978 to 7,326 lbs.